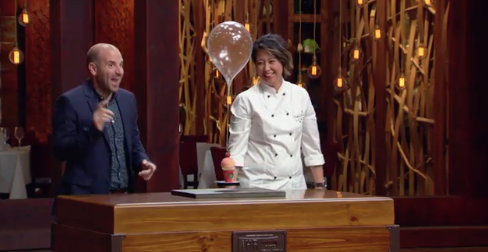 On the Australian version of the hit show MasterChef, the impossible: An ice cream float — that’s ice cream, anchoring a floating, edible balloon. If you aren’t familiar with the show MasterChef, which airs here in the U.S., the basic concept is a 3-judge panel cooking show that pulls amateur cooks from around the country to compete against each other for the title of Master Chef. The show is a big hit, spawning versions all over the world. Recently, on the Australian version of the show, one of the most challenging “pressure tests” ever was bestowed upon three 20-somethings. The challenge was to create a floating ice cream cone, suspended by an edible balloon made of sugar and pumped with helium. They had 3 hours to do it. Impossible! Well, apparently not — check out this still from the episode, displaying the perfect target execution of the dessert. Need helium for your retail store? Or maybe your restaurant’s dessert menu? Zephyr can give you a free helium quote any time! In the end, some of the challengers balloons floated, one balloon was missing entirely, one chef was voted off, and Australians were left amused and yet angered by the challenge. Make the edible balloon float at home! If you are an adventurous spirit and want to try to make this dessert at home, you can! The TV show has made the step-by-step recipe available to everyone that wants to try it. Block out a few hours, this recipe is 55 steps long. And there is no guarantee on your edible balloon! Think they make it look it easy on TV? The edible balloon isn’t a new concept, believe it or not. In January of 2016, we did a feature article on the incredible edible balloon that is expertly executed each and every night at the popular Chicago restaurant, Alinea. If you didn’t see that article, be sure to check it out here — Chef Grant Achatz’s green apple, floating edible balloon is something to behold! Better yet, if you’re in Chicago, you might want to just pop in to Alinea for dessert and taste it yourself!